Chichester City’s hold on top spot remains slippery despite the wet weather preserving their place for another week. Miles Rutherford’s side left it late last weekend, with Josh Clack striking in injury time to seal a 2-1 away win against Broadbridge Heath. The close range bullet header sparked wild celebrations from the Chi contingent who knew how important the come-from-behind win could be at the end of the year. Those smiles got even broader when they emerged from a mass bundle after news filtered through that second-place Newhaven drew at Little Common. 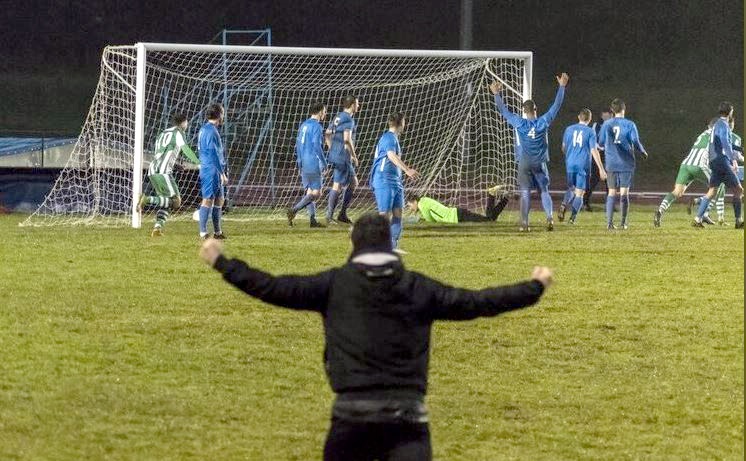 That gave Chi a two point lead at the top of SCFL Premier – something that remains after Newhaven’s game in hand against AFC Uckfield was postponed due to a waterlogged pitch. City will seek to extend the lead tomorrow when they welcome East Preston to Oaklands Park (3pm). Rutherford’s side head into the match full of confidence after a strong performance against a tough Bears side. Even with the return of leading scorer Scott Jones and winger Gicu Iordache from suspension, along with a debut for Ryan Young in goal, it was the home side who took the lead. Chi took until after the break to respond with Jones getting on the scoresheet with 20 minutes to go. A draw looked certain until Clack popped up to seal the win and top spot for another week. In SCFL Division One, Selsey’s charge on the top four continues after Blues made it a magnificent seven games unbeaten with a 2-0 win at Seaford last weekend. Joe Bennett and Callum Dowdell struck in the second half to seal the win which puts Daren Pearce’s side just one point behind AFC Varndeanians in fourth. Next up is a trip to sixth-place Hailsham Town tomorrow (3pm). Selsey could also have a rearranged Division One cup match against Wick after the clash on Tuesday was abandoned at half time due to the weather. Fellow SCFL Division One side Sidlesham are up to ninth after a 1-0 win at Southwick last weekend with Jon Fryatt scoring. AFC Varndeanians will be the visitors to the Rec Ground tomorrow (3pm). In SCFL Division Two Bosham will be looking to bounce back at home to Jarvis Brook tomorrow (2pm) after suffering a 2-1 reverse against Rottingdean Village last weekend. Ryan Coombes scored for the Robins.